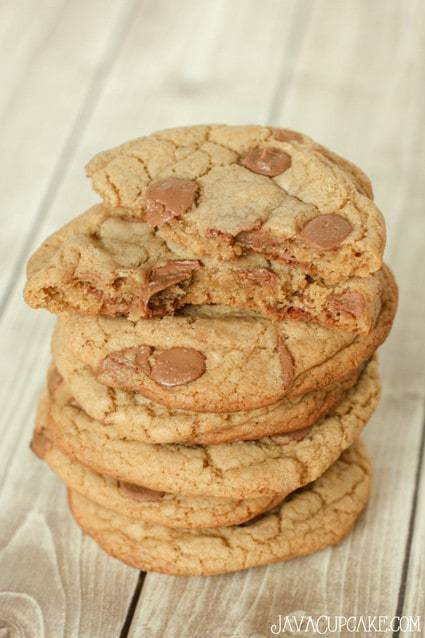 Rich and nutty browned butter paired with dark brown sugar and milk chocolate chips from Hussel Confiserie make for the perfect, same-day chocolate chip cookie! Sometimes, I’m just in the mood for cookies. Like I want them today, not tomorrow, not next week. Today. 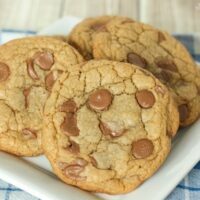 My favorite recipe for chocolate chip cookies require chilling the dough overnight to make the perfect chewy chocolate chip cookie. Seriously though, I don’t have time or patience to wait for cookie dough to set in the refrigerator overnight! So last week, I set out to try a new chocolate chip cookie that would produce the same chewy, soft in the middle, crisp on the edges cookie that could be made in one day! In the past, same-day cookies have turned out horribly for me. They typically run all over the cookie sheet and get too crispy or don’t spread at all. I just can’t seem to get it right. Yes, I’ve tried the Nestle recipe, but I just don’t love it. It’s just kind of… bleh. 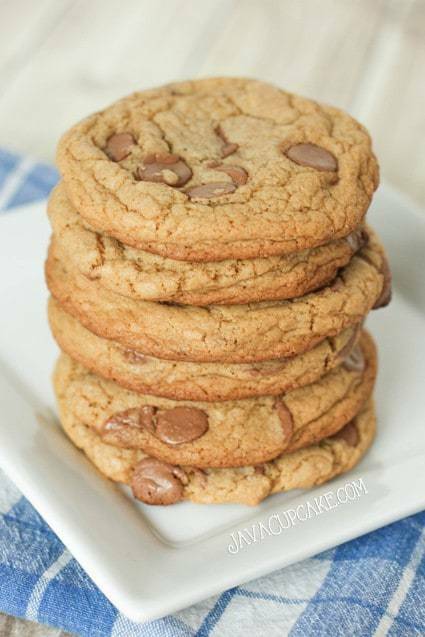 I asked on my JavaCupcake Facebook page what some of your favorite recipes for chocolate chip cookies were and was surprised to see so many recipes I’d never tried before! I researched a few that stood out to me and decided to try America’s Test Kitchen Perfect Chocolate Chip Cookies. Of course, since I’m baking them, I had to add a bit of JavaCupcake spice to the mix and used Hussel Confiserie milk chocolate chips and added a hint of nutmeg to the batter. Yum. And my Browned Butter Chocolate Chip Cookies were born… my new favorite! The technique of this recipe was one I had never tried before. It called for browning the butter and the whisking the sugars, eggs, salt and vanilla in stages allowing the sugar to really dissolve into the butter and for the mixture to become glossy, thick and cool. Also, the dry ingredients required measuring by weight instead of volume (cups) which was a technique I had never done before in making cookies. I was pleasantly surprised at how simple it was to make these cookies. One pan, two bowls, a whisk and a spatula was all I needed. No stand mixer or creaming of butter and sugar together were required, which was a total WIN in my book. The size of the cookies were perfect too! One cookie was enough to satisfy my cravings for chocolate chip cookies! 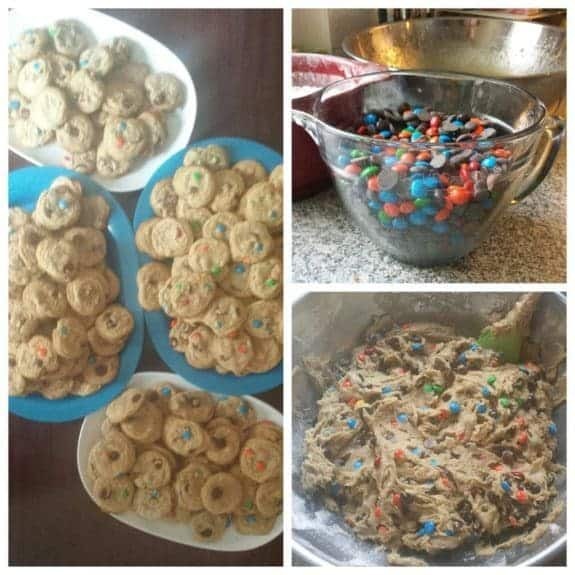 Fast forward: This week, I QUADRUPLED this recipe, added M&M’s and made 13+ dozen cookies for a group of 150 soldiers! The picture above is a collage of the Facebook & Instagram pictures I posted here, here & here. I was speaking to the soldiers my husband works with about a BBQ our Family Readiness Group is hosting for them and knew that I couldn’t come empty handed! So I made them this recipe for cookies and almost EVERY soldier said WOW or OMG or Woah that’s the best cookie I’ve ever had. So… if that isn’t a rave review for these cookies…. I don’t know what would be! 150 soldiers can’t be wrong! Preheat oven to 375F degrees and place the baking rack in the center of the oven. Line three baking sheets with parchment paper. In a small bowl, whisk together the flour, baking soda and nutmeg. Set aside. In another small bowl, measure the sugars. Add the salt and whisk together. Set aside. In a large pan over medium-high heat, melt 10 Tbsp of the butter. Cook the butter, stirring constantly, until it browns and smells nutty. Remove from heat immediately and pour into a large heat-safe bowl. Add the remaining 4 Tbsp of butter and stir until melted. Add the sugars to the browned butter and whisk until smooth, about 30 seconds. Add the eggs and whisk another 30 seconds to combine. Let the mixture stand for 3 minutes then whisk for 30 seconds. Repeat this process a total of three times. Pour the flour mixture into the bowl and using a rubber spatula, stir until just combined. Add the chocolate chips and stir until incorporated. Press down on the dough to ensure that no flour pockets remain in the dough. Divide dough into 18 balls. Place 6 balls of dough onto each prepared baking sheet, at least 2 inches apart. Bake one sheet of dough at a time for 10-12 minutes, rotating the pan half way though baking. Allow the cookies to cool for 3 minutes on the baking sheet before removing to a wire rack to cool completely. Store in an air tight container for up to a week... that's if they last that long! These look amazing. Brown butter adds so much to everything it’s used in! Love it. I love your additions to this recipe. The nutmeg is a brilliant addition. Thanks, Christie! The nutmeg gives it a little something extra that leaves you going… Mmmmmm m mmmmm good! Oh my gosh these look FANTASTIC!!! I’m in love with brown butter anything. 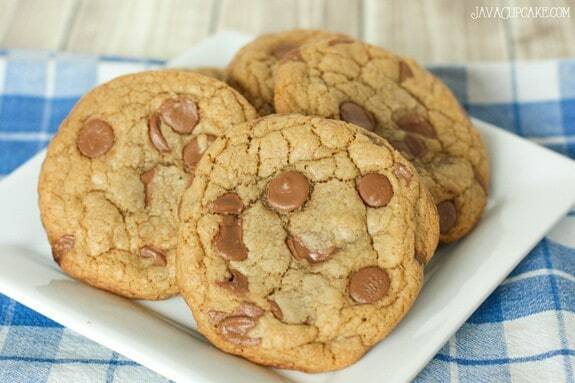 Can’t go wrong with a chocolate chip cookie! These look perfect. LOVELOVELOVE!!!! Amazingness, everything I want in a cookie! Brown butter makes everything taste better! I bet these cookies are amazing! I couldn’t agree more, Mallory! Where is a good place to get a scale to weigh ingredients? Bed, Bath and Beyond should have them. Target, WalMart should too. 🙂 They’re pretty inexpensive. Ohh… CHRISSY, it’s YOU! lol I just looked at the name after I started writing back. I have one I “stole” from Chasity when she moved. I “forgot” to give it back to her. haha But they really aren’t that pricey. You can get a good one for under $20.